Home » Vestments » The History of Watts & Co.
Before beginning my first article for this exciting new venture, I would like to say what a great privilege it is to have been asked by Shawn Tribe to become involved as a fixture at the Liturgical Arts Journal. 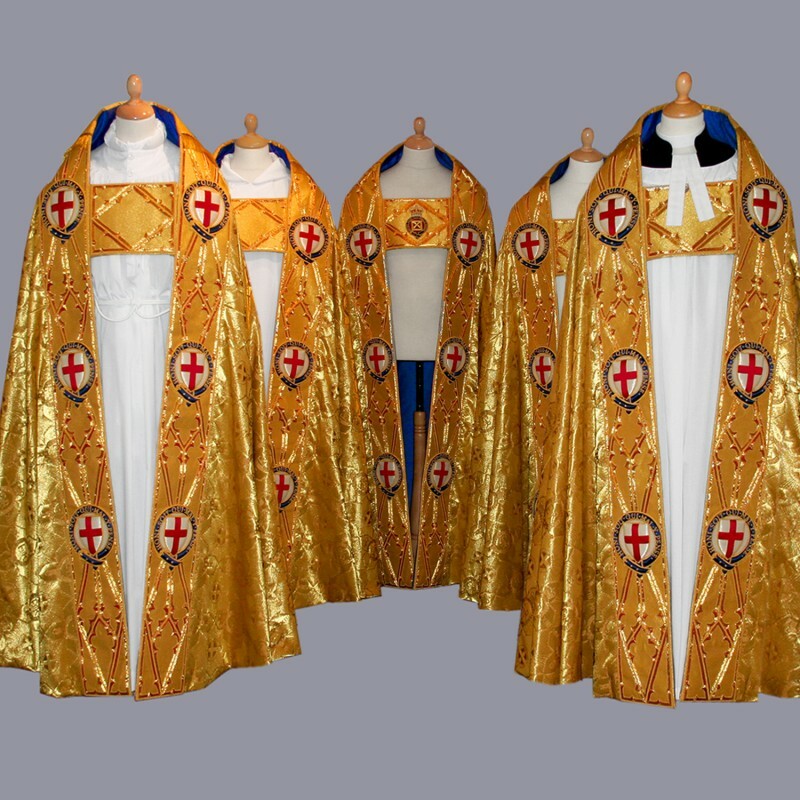 My introduction states that I am creative consultant to Watts & Co, based in Westminster, a firm of vestments makers who are well known to many for producing the highest quality vestments and hangings in terms of materials, shape and workmanship. Beyond our name however, people are often unaware of our proud history of over 140 years, and it is to this that I would like to introduce you. This long and rich history is a narrative of refined taste, historic grandeur, and cutting edge style. In addition to our ecclesiastical work we also hold an equally fine history in interior furnishings and hand blocked wallpapers. 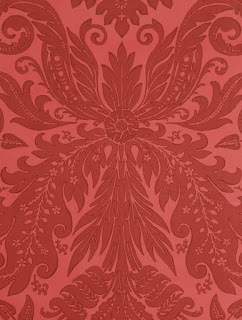 Venetian wallpaper, designed by GF Bodley for Morris & Co.
Watts & Co was founded in 1874 by three architects who need no introduction: G. F. Bodley, Thomas Garner and George Gilbert Scott Jnr. 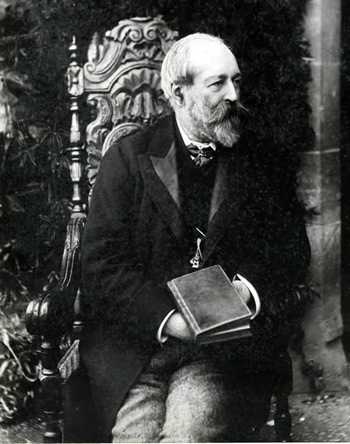 All three architects were trained in the office of Scott Snr, and their passion for the Gothic revival in Ecclesiastical design came through there. 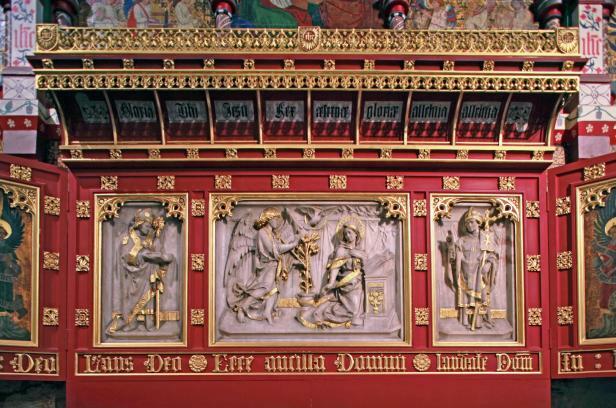 Our founders initially worked extensively with Morris, Marshall, Faulkner & Co. Arguably their most notable and complete work is St. Martin-on-the-Hill in Scarborough, which saw the coming together of such luminaries of the Pre-Raphaelite movement as Maddox-Brown, Burne-Jones, and of course Morris himself. 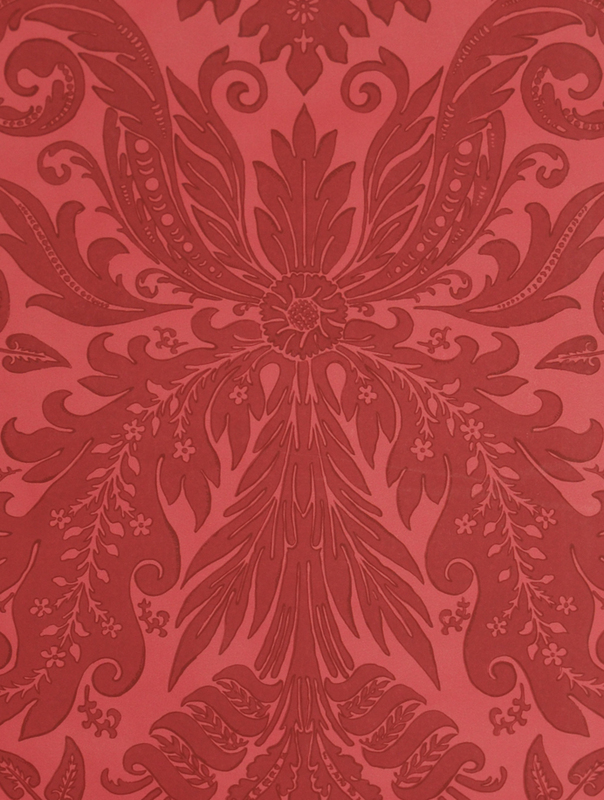 Indeed two wallpapers which form part of the Morris patrimony were designed by Bodley & Scott (Venetian and Indian respectively). 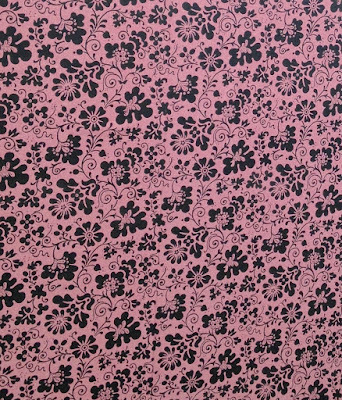 However tensions arose between the architects and Morris, who attempted to exert an increasing creative influence over the work entrusted to him. They found much the same was true of any other firm the attempted to use. Therefore, seeking complete creative control over the work, they established Watts & Co in 1874, under Bodley’s principle direction, with Garner directing Burlington & Grylls who specialized in stained glass. We are often asked where the name Watts comes from. Indeed some people make the (not unreasonable) assumption that there once was a Mr. Watts. We may well never know the real reason why the name was chosen, though there are various theories. The significant thing is that none of the three founders would put their own names to the firm: it was Not Done in those days to put one’s name to anything so crass and common as trade. Our first showroom opened on Baker Street at number 30 in 1874, under the creative direction of J. L. Davenport. There is a little known connection between Davenport and Sherlock Holmes: Davenport lived above the shop, and was known for an eccentricity of dress and also an ability with the violin. The location of Watts’ showroom also gives us a clue as to the location of 221b Baker Street: in one of the stories, Holmes breaks in to the upstairs of number 30 in order to spy on his front door to watch for Moriarty. Commissions then began flooding to Baker Street, thanks to the three partners. The most important of which were a set of copes made for Queen Victoria’s jubilee in 1887, and another set in 1897. The constituted the first vestments to be worn at Wren’s Cathedral of St Paul. In addition to this Watts began its daily round of vestments for parish churches, both in the United Kingdom and overseas, which continues to this day. This included work, not just for Anglican churches, but also for Catholic churches. 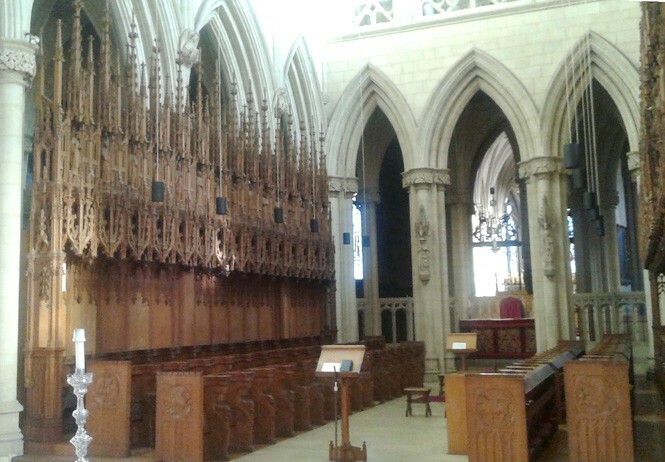 Most notably Downside Abbey, where Garner built the choir of the new church. This relationship was to continue for many years, and the church is covered in our fabrics, and the drawers bear testimony to our vestments work. The son of our George Gilbert Scott, Sir Giles Gilbert Scott was to also have a part in the building of Downside some years later, further cementing a relationship. We have also undertaken work for Westminster Cathedral, and have records of making at least one original High Altar frontal. In addition to the high quality ecclesiastical work Watts was undertaking, the company was also at the height of fashion in terms of interior furnishings, and our hand blocked wallpapers and specially designed furniture were in high demand, in Bishops’ palaces, university colleges and stately homes, including, most notably, Powys Castle and Ham House, where many of the original wallpapers may still be seen in situ. 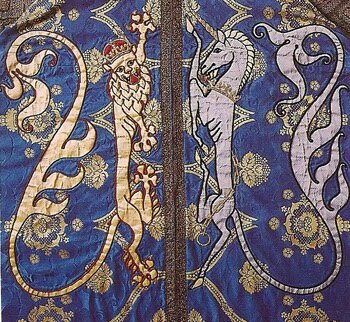 Watts then continued its work through the 20th century, producing vestments for state occasions (every coronation except George V saw a new set of copes at Westminster Abbey made by Watts) and for ordinary parishes, and wallpapers for the rich and famous. Wars came and went, and the blitz saw our archive, which had been put in to safe storage, destroyed. We therefore, sadly, have no extant records pre-1939. Watts experienced something of a culture change in the 1950s, in the form of Elizabeth Hoare. Granddaughter of Scott Jnr, and great-grandniece of Bodley, she gave up a promising career in film when she married Graham Hoare of the banking family. To Watts she brought a certain panache and style which have been missing before, she also had a brilliant eye for colour and often a very cutting tongue. 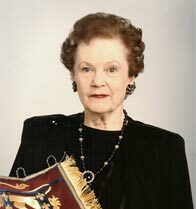 There is a story of her visiting a cathedral “somewhere in England” and being shown round by the dean, they came to the High Altar and she was confronted by a frontal executed by her bette noir, Beryl Dean. The dean asked the inevitable question “Well Mrs. Hoare, what do you think of our new frontal”. Betty paused for a moment (she was famed for her timing) and responded with a deadpan face “I don’t give opinions on rubbish”. Her arrival also coincided with several younger architects taking an interest in Watts, most notably Bob Maguire (St. Paul’s Bow Common, 1956 and the FABYC houses at Kew) and Stephen Dykes-Bower (St Edmundsbury Cathedral, surveyor of the fabric to Westminster Abbey). These two, together with other notables such as George Pace (surveyor to the Church in Wales), Sebastian Comper, Robert Potter (church of the Ascension, Crownhill, Plymouth), Alan Rome (Surveyor to Leicester Cathedral). With Keith Murray at the helm Watts’ design was at the forefront of what is becoming termed the “new Elizabethan” style, tied in with the optimism of the Festival of Britain, and drawing heavily on the Liturgical Movement. 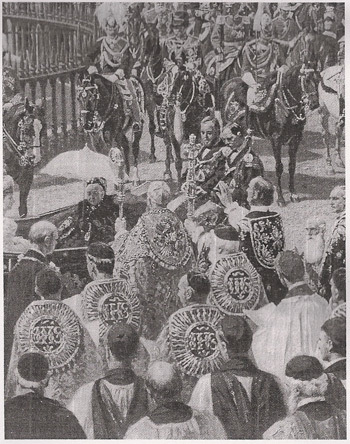 This is best evidenced by the copes made of Queen Elizabeth’s coronation in 1953: a marked change to what had gone previously, but still the high quality work with which Watts has so long been associated. In the field of interior furnishing, we also continued to lead the way. 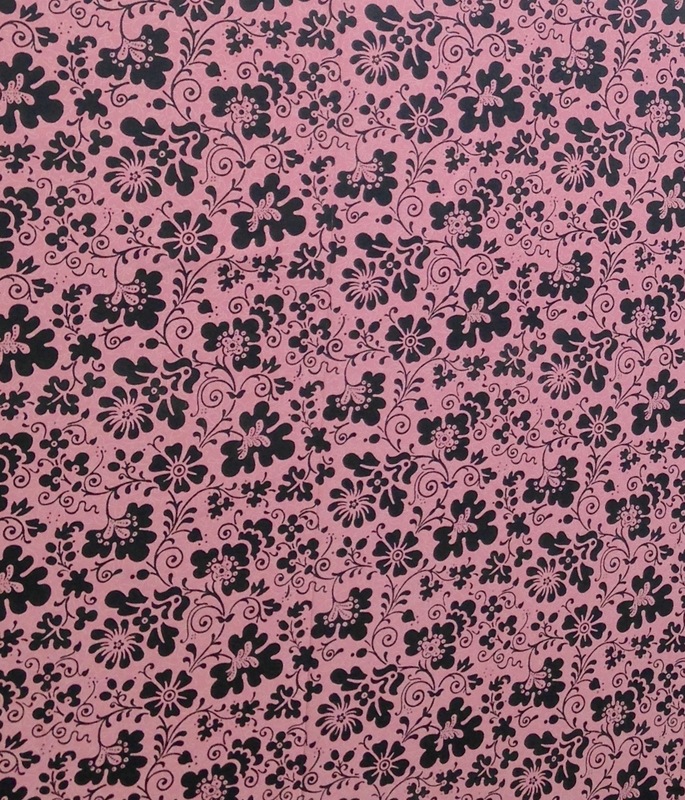 John Betjeman had his house refurbished in Watts wallpapers, and a former employee relates the incident of he and Cecil Beaton arriving at the showroom one afternoon, after a good lunch, and creating a new colour-way of the Victorian “Bodley” pattern wallpaper. The 1980s saw Watts divide into two companies: Watts & Co, which continued at Tufton Street and Watts 1874, based at Chelsea Harbour Design Centre. With D. J. Gazeley taking over as director of Watts & Co in 2001, Watts continues to lead the way in ecclesiastical tradition and innovation, with work in almost every English cathedral, and a vast body of work overseas, in all church traditions. 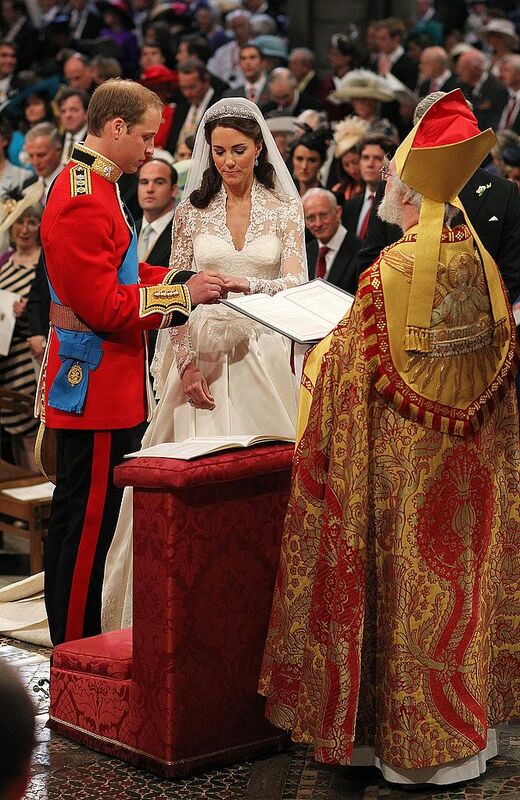 Recent work has included commissions for the Royal family (a cope for the most recent Royal Wedding), the Tower of London, Christchurch Oxford, Westminster Cathedral, St George’s Chapel, Windsor, Lichfield Cathedral, St Patrick’s, Soho Square, London & St. Ignatius of Antioch NYC. In addition, we have added another architect to our list: Craig Hamilton, and the work at Culham Chapel. I am indebted to Mr. David Gazeley & Dr. Ayla Lepine for their assistance with information supplied for writing this article. Richard Hawker is an experienced liturgical Master of Ceremonies & Creative Consultant to Watts & Co Ltd.